Boss Mick Harford has already made his mind up over who is going to play upfront when Town head to Bristol Rovers this weekend, but will leave supporters and Luton's opponents guessing until the team is announced at 2pm. 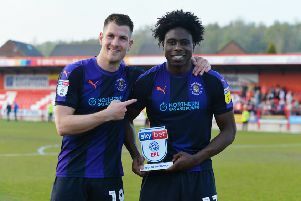 The Luton chief saw both Danny Hylton and Kazenga LuaLua find the net on Saturday in a thoroughly comprehensive 4-0 win over Doncaster Rovers. However, he now has 20-goal top scorer James Collins back from international duty with the Republic of Ireland to give him a serious selection headache. Harford knows which two will lead the line though, as he said: “We’ve decided, but I’m not going to give it away in terms of who’s playing upfront on Saturday as we don’t want to give any information out to the opposition, but we’ve decided who’s going to play upfront. “We’re not short in the striking department and we have another very good player coming in shortly from Brighton, Aaron Connolly, so there’s a lot of options in our striking department. Collins has only scored once in his last six games that he has started alongside Hylton, with the latter netting three times in total during those matches. When asked if the pair are suited as a partnership, Harford said: “They’re similar in size and two target men, but in my opinion, they do complement each other, in a certain way, as when the ball goes forward, we try to get them into a certain shape to try and get the best out of them. Although Collins didn’t feature for his country, an unused sub against both Gibraltar and Georgia, he has come back fresh from the experience, with Harford saying: “He said he worked hard, they trained hard and he did some extra stuff when he wasn’t playing, so he’s kept his fitness up. “Going away there was probably really refreshing for him and you know as well as I do, how hard he works for the football team, in terms of his effort and work-rate. It isn’t just Collins, Hylton and LuaLua who are at Harford’s disposal either, as the manager has both Harry Cornick and Jason Cummings raring to go too. He added: “Harry’s been massive for this football club since he came here, in terms of his energy, his work-rate, the way he runs in behind, the way he stretches the opposition. “Jason’s come in and worked hard in training, in his first game he played, against Wycombe, he created two goals for us by being clever in those spaces. “He got a little bit of time at the weekend and he’s been very, very patient like all of them have.